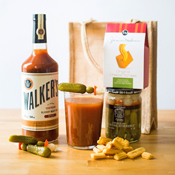 Designed for the Bloody Mary lover, this popular gift is built upon a classic - Walker's Southern Bloody Mary Mix. Starting with tomatoes and fresh squeezed lime juice, this zesty mix hits a whole new level with the addition of bourbon barrel aged Worcestershire, blackstrap molasses and Creole mustard. Did someone say spicy? The fun really begins with the accoutrements! Our festive cocktail skewers are composed of a crunchy pickle, green olive, a slice of red pepper and a pearl onion bathed in a subtle brine with just a hint of garlic and dill. 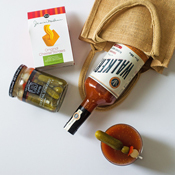 The perfect nibble to accompany the perfect Bloody Mary? Aged Cheddar Cheese Straws. This Southern classic has a light, crisp texture, and full-blown cheddar flavor, with just a hint of hot. 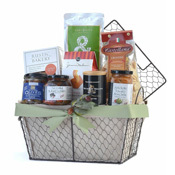 A perfect gift for the host, hostess, or any vodka or gin lover! 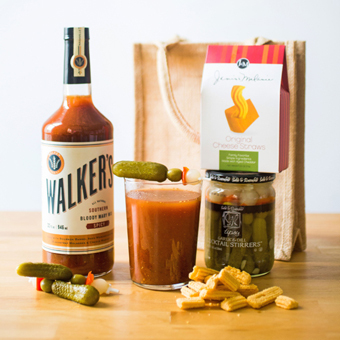 Walker's Feed Company - Southern Bloody Mary Mix: All-natural ingredients make this savory and spicy concoction, combines bourbon barrel aged worcestershire sauce, blackstrap molasses and Creole mustard. Sable & Rosenfeld - Tipsy Cocktail Stirrers: Each hand-packed skewer is made up of a crunchy pickle, green olive, a slice of red pepper and a pearl onion bathed in a subtle brine with just a hint of garlic and dill. The perfect garnish for a Bloody Mary! J&M Foods - Aged Cheddar Cheese Straws: Baked to perfection for a crispy, crunchy nibble, these snack-worthy cheese straws combine aged cheddar cheese with just the right amount of spice. JUTE GIFT BAG, 12"x12"x7 3/4"